We have pizza delivered so often that all the delivery guys know Harley by name. We have decided to make a conscious effort to cook more meals at home and want to try to document a few here. 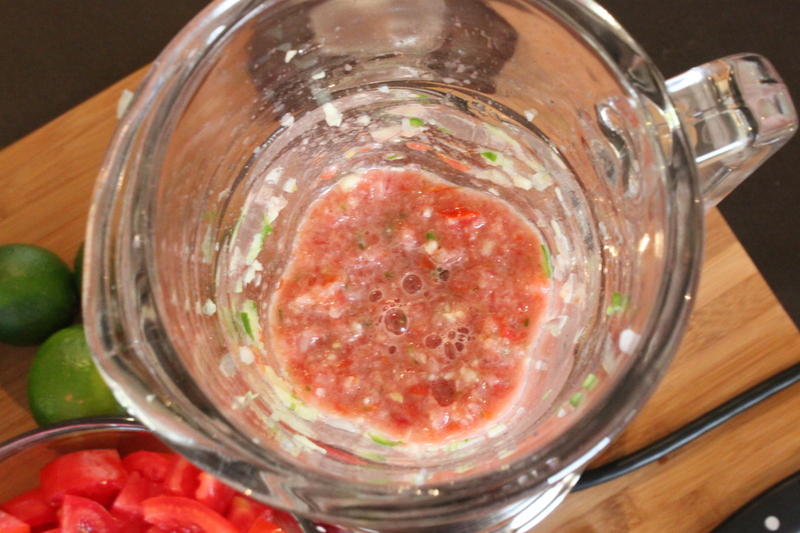 Salsa is so easy to make in the blender. If I make a batch on Saturday, it’s usually all eaten a couple of days later. A trip to the Mexican grocery store down the street will yield everything I need for less than 4 bucks. 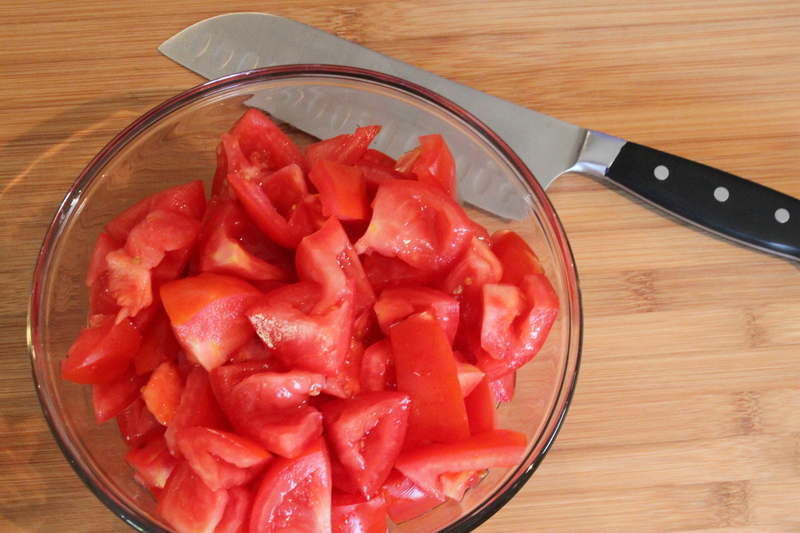 Roughly chop the 2 pounds of tomatoes and squeeze out the juice and seeds. 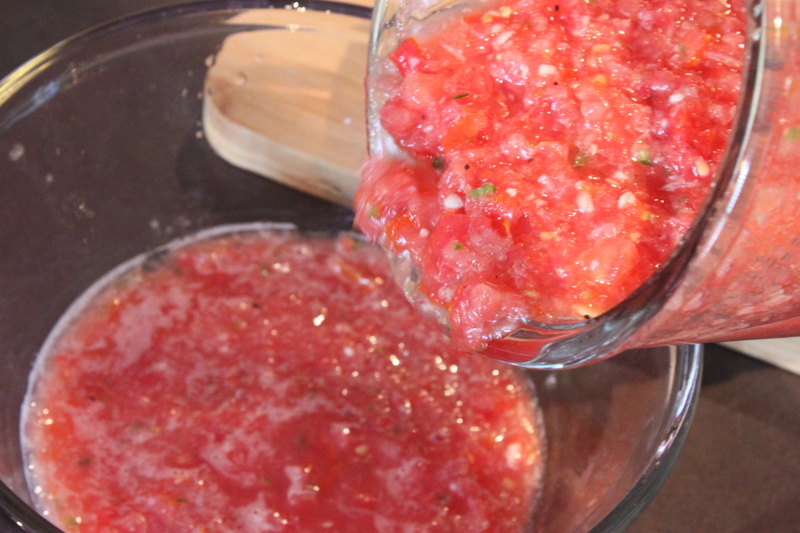 I always do this to keep my salsa relatively thick and not very watery. I dice the shallots and garlic. Shallots are much milder than onions, I think onions overpower food…but shallots, just enough flavor. 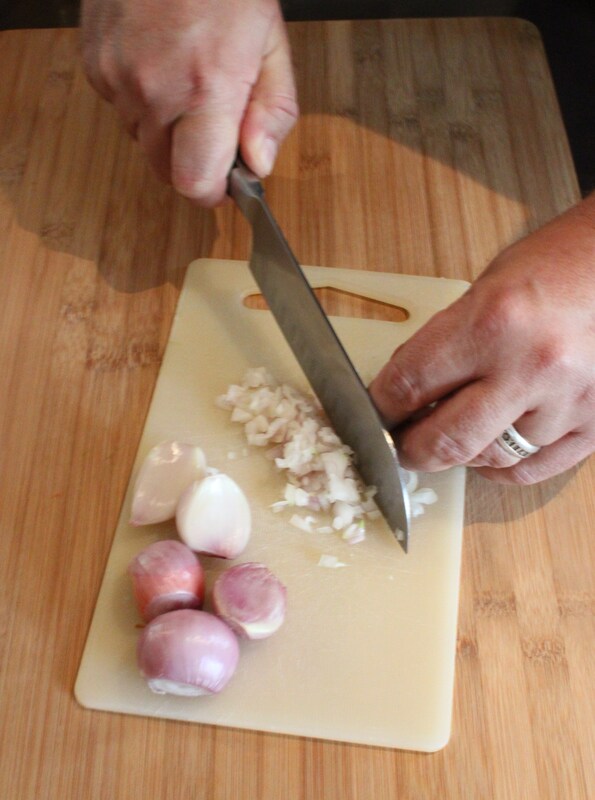 Always chop onions, garlic and peppers on a plastic cutting board. A wood board holds these flavors in and transfers them to everything else you cut on it. 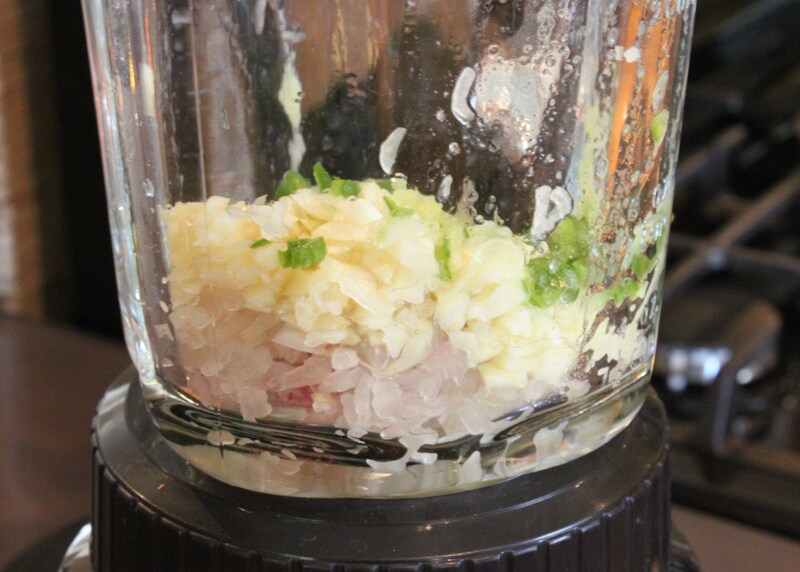 I load all the finely chopped shallots and garlic into the blender. Then move on to the serrano peppers. They pack a lot of heat for a small pepper, use as many as you can handle. OK, this is incredibly “White People” of me, but I always wear rubber gloves when handling hot peppers. The first time that you rub your eyes with a little bit of pepper juice on your fingers – you will start wearing rubber gloves too. The seeds are the hottest part of the pepper. 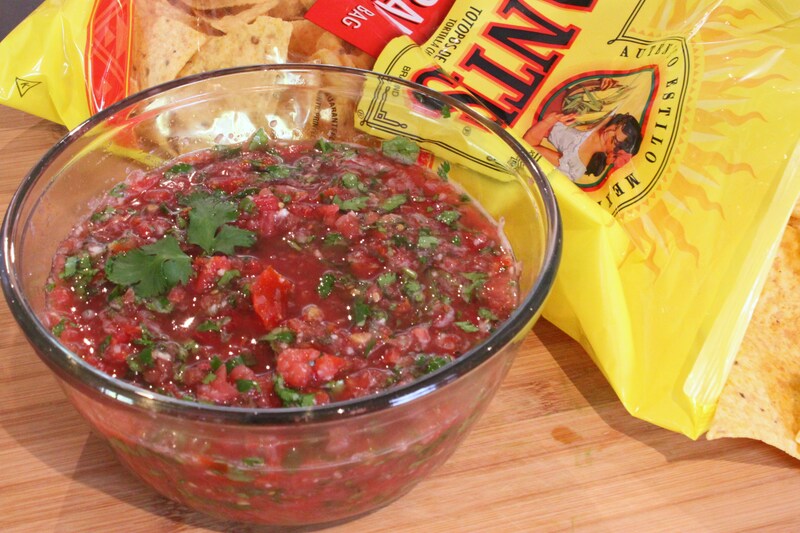 Leave them out if you want a “warm” salsa, and keep them in if you like your salsa “Volcanic”. 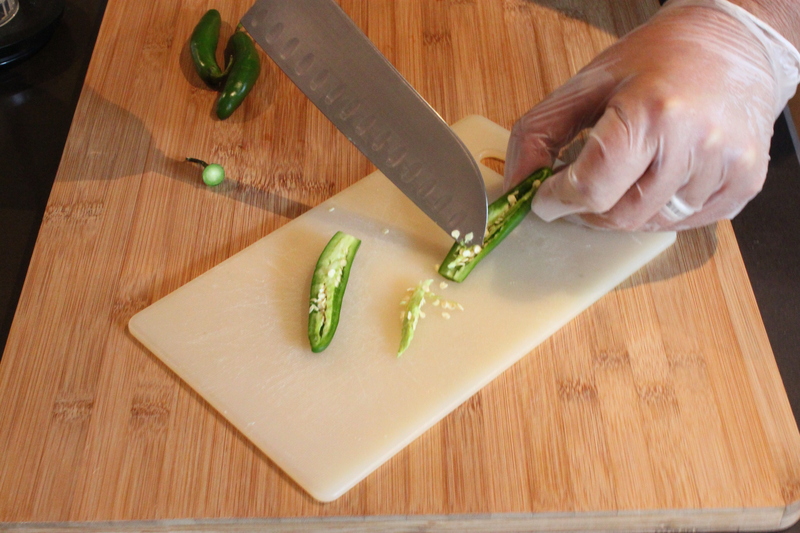 I slice the peppers in half and use the tip of my knife to gently push the seeds out…then dice all the green part. The diced serrano peppers go into the blender with the already chopped shallots and garlic. 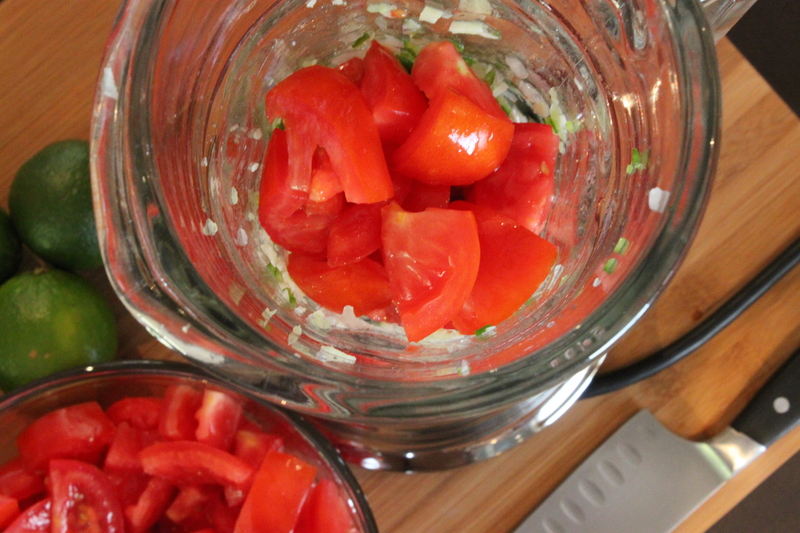 I throw a small handful of tomatoes on top of the shallots/garlic/serrano mixture. 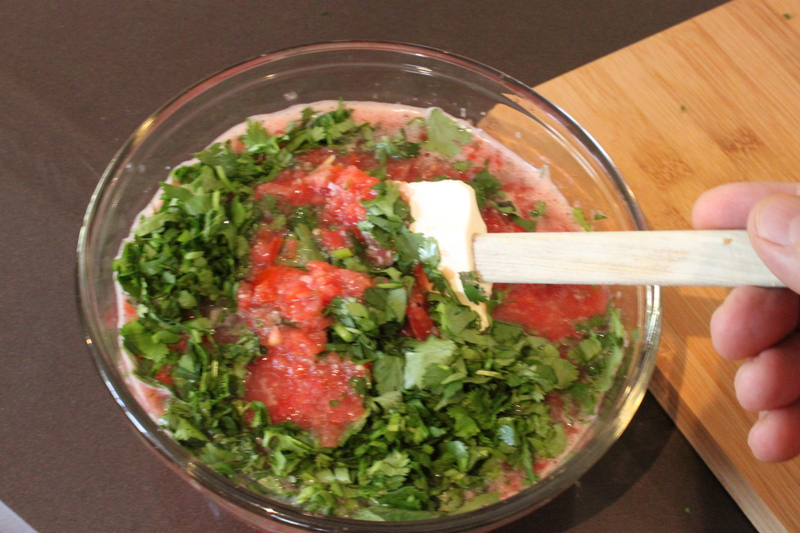 ….and blend all these ingredients lightly to grind them up smaller. 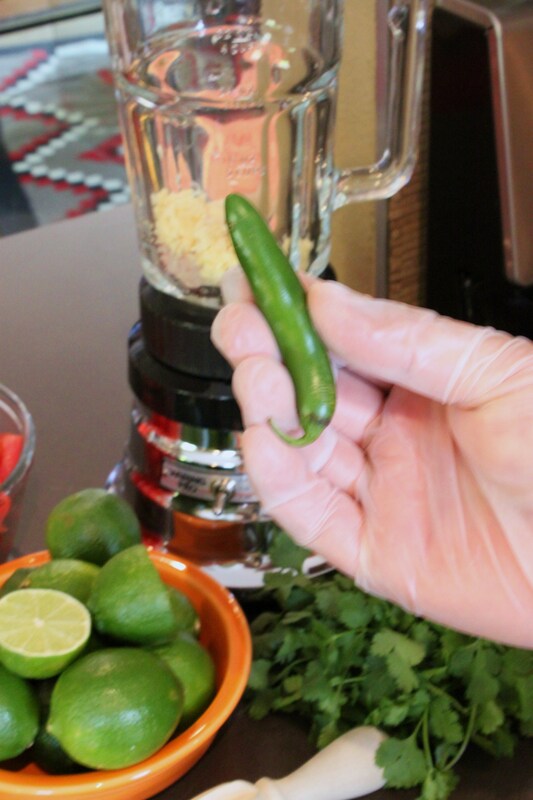 Just one quick pulse on the blender. I don’t want to liquefy, just chop the mixture a slight bit more. 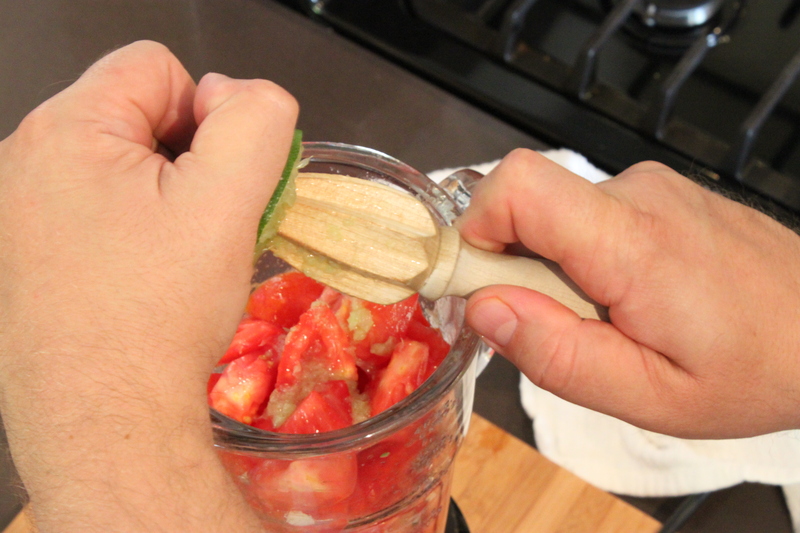 Add all the remaining diced tomatoes and squeeze in the juice of the limes with a reamer. 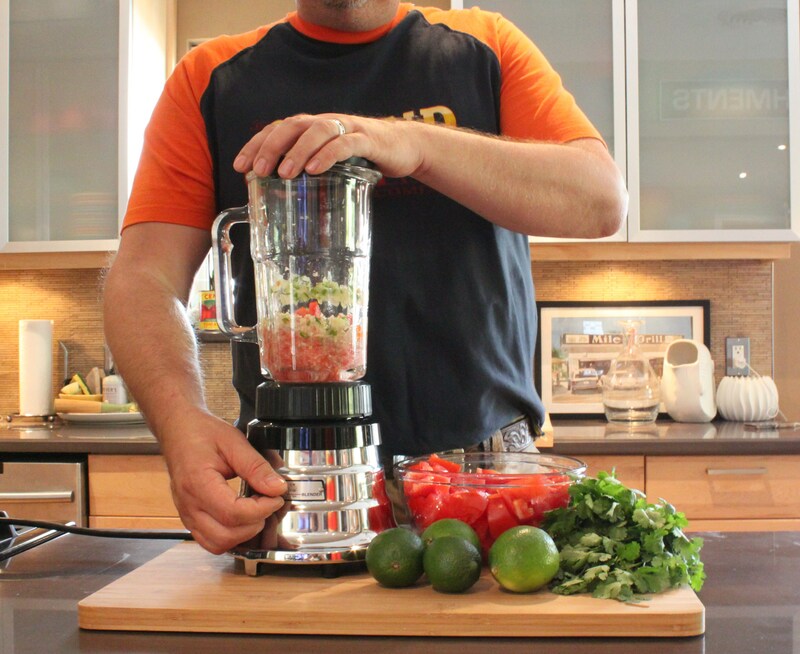 A quick blend with the blender will grind all my tomatoes into a perfect salsa. Don’t overblend…this isn’t a soup. Keep it chunky. 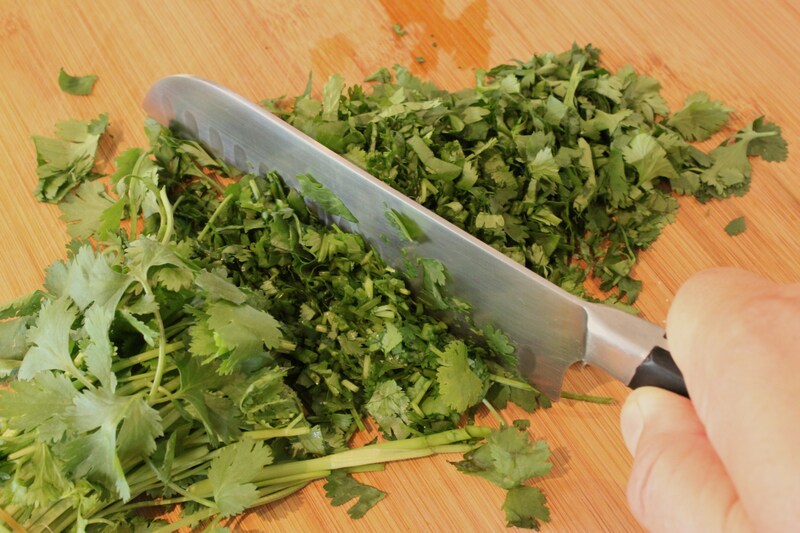 Roughly chop the washed cilantro……. 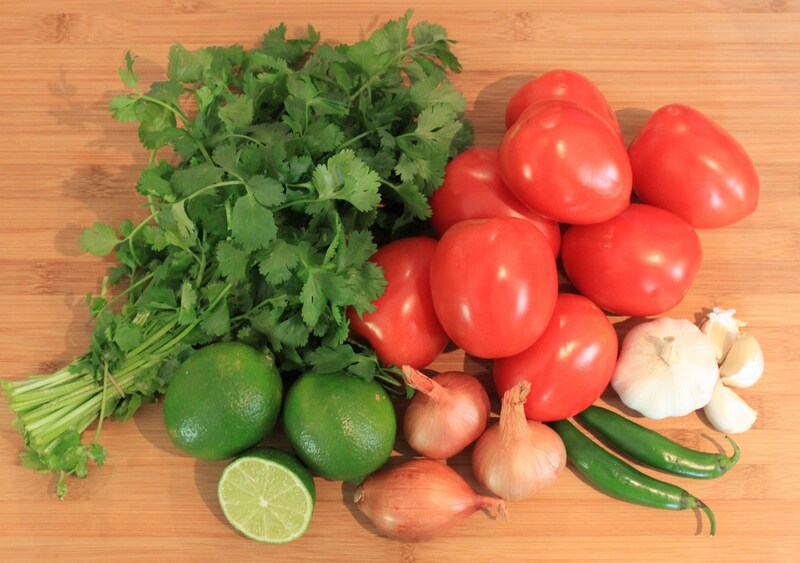 …and mix it into the salsa. This is the best time to salt and pepper to taste too. 10 minutes. Almost no calories.. No chemicals, No preservatives, and I control the salt.